Go to Quicklinks in your web browser. Hover over the Operations tab in the brown navigation section and select Crystal Reports. Click the link in the popup window for Crystal Reports if you do not want to wait for the browser to go there on its own. Expand the folders in the navigation on the left side of the screen to Home | Public Folders | FRS. 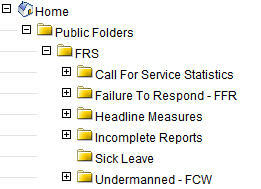 Click on the Sick Leave folder and note the reports that appear in the main window on the right side of the screen. Click the name of the report you would like to run (not the Schedule, History or Properties). Input the requested information on the report (e.g., dates, battalion, etc.) and click the OK button. Wait for the report to load. Note: This may take a couple minutes. Drill down to specific parts of the report (if you chose not to narrow down the data within your search) by clicking any group names in the middle section of the report. Remember to log out of the application when you have finished (instead of closing the browser) by clicking the lock symbol at the top-right corner. It is flanked to each side by one other icon.